The latest Israeli assault on the besieged Gaza Strip, which lasted for 50 days, has captured global attention for the heavy death-toll inflicted by the IDF (Israel Defence Forces) against Palestinian civilians. However the latest war also suggests that the ongoing Israeli occupation finds itself unable to dictate terms in the same way. On August 26th an Egyptian ceasefire proposal put an end to hostilities between Israeli occupation forces and the Palestinian Resistance providing much needed relief to the 1.8 million Palestinians who have been living under siege since 2007. This latest wave of Israeli state terror against Gaza began on the 8th of July when the IDF (Israeli "Defence" Forces) initiated airstrikes against Gaza followed by ground invasion on July 17th resulting in the deaths of anywhere between 1,975 and 2,008 Palestinian deaths with the majority of them, at between 71 and 83 percent, being civilians (figures sourced from the UN and the Palestinian Centre for Human Rights respectively). Why did Israel launch this offensive? The current crisis was ostensibly triggered by the abduction and murder of three Israeli teenagers on the 12th of June. Three days later on the 15th of June, Israel's Prime Minister Netanyahu blamed Hamas for the crime without providing any evidence. However since then, Hamas Chairman Khaled Meshaal tacitly admitted on the 22nd of August that if Hamas members were responsible for the crime, it was done without the knowledge or instruction of Hamas' leadership, and the two suspects to the crime arrested by the IDF so far have been Hamas activists. More importantly, the abductions did provide Israel with a pretext to pursue broader political objectives. When Netanyahu claimed on the 15th of June that "those who perpetrated the abduction of our youths were members of Hamas", it's quite revealing that he also added the following, "the same Hamas that Abu Mazen made a unity government with. This has severe repercussions." This refers to the agreement reached on the 23rd of April between Fatah and Hamas to form a unity government, which has the potential to reconcile seven years of mutual distrust and animosity between the Hamas-ruled Gaza Strip, and the Fatah-ruled West Bank. This split between these two largest Palestinian political parties began with the victory of Hamas in the 2006 Palestinian Legislative Elections. The news wasn't received well by the Israeli government, who along with the United States and European Union, demanded Hamas "renounce violence" and formally recognise the right of Israel to exist. Hamas responded by stating that they would be unwilling to make any such promises or recognitions so long as Israel continued its occupation of the West Bank, which is territory that has been controlled by Israel ever since the defeat of the Arab states in the 1967 six-day war. The occupation is considered illegal according to international law because immediately after the 1967 war, the UN passed Resolution 242 calling on Israel to withdraw from those territories. Israel responded by imposing an economic embargo over the occupied territories and the United States and European Union cut all financial aid to the Palestinian Authority in what was a mostly successful attempt to reverse the election result, by starving the Palestinian Authority of funds, and in doing so, essentially punishing the Palestinian people for voting the wrong way in a free election thereby demonstrating the level of control Israel has over Palestinian political life. According to the UN, these sanctions resulted in a 30 percent increase in the number of Palestinians living below the poverty line. Despite having won the elections outright, and despite forming a parliamentary majority, Hamas sought to diffuse the situation and blunt all attempts by Israel to divide the Palestinians by forming a short-lived unity government with Fatah. The deal was rejected by Israel. What followed was a partially successful coup attempt launched by Fatah, Israel and Egypt to remove Hamas from power. In the West Bank, Israel arrested nearly all Hamas MPs, which enabled Fatah leader Mahmoud Abbas to assume the position of unelected President. The Egyptian government then cooperated with Israel to arm Fatah's military wing, the Al-Aqsa Martyrs Brigade, in an attempt to violently dislodge Hamas from power in Gaza. When these attempts failed, the corporate media condemned Hamas' for its ‘violent seizure of power’ in Gaza, when a more accurate version of events would contend that Hamas, having been undemocratically ousted from power in the West Bank, had successfully prevented the same happening in Gaza. The willingness of Israel and the United States to use subversive and coercive means to ensure the continuation of Fatah’s political hegemony stemmed from the latter's willingness to make heavy concessions. Indeed by the time of the Olso Accords (1993-95), the Fatah-dominated PLO was willing to go so far as to normalise Israel's military occupation over the West Bank where 70 percent of the land would remain reserved for Israeli colonies (see ‘Area C’ in Figure 3), with the only concession being that the Palestinian Authority would be allowed direct governance over major cities. Although the Hamas charter by comparison does indeed call for dismantling of the Israeli state in its entirety, by 2006 their position had become more conciliatory. Although Israel, the United States, and the European Union had all demanded Hamas "renounce violence" and formally recognise "Israel's right to exist" (that is to amend the Hamas charter), Hamas' response was to declare that it would not agree to these demands until Israel withdrew its forces and settlements from the West Bank. In other words, for all the denunciations of Hamas as unreasonable extremists, their demand for Israel to withdraw to the 1967 borders was merely stating the international consensus as embodied in UN Resolution 242, which, if adhered to, would require the removal of all Israeli military checkpoints and civilian settler-colonies from the occupied territories (West Bank and Gaza), which in turn would form a future Palestinian state. Israel justified its siege of Gaza (which began in 2007) as the necessary means of removing Hamas from power. The logic was that the effects of the siege would weaken Hamas militarily while punishing Gaza's civilian population, making their lives miserable to the point where they'd be willing to withdraw support for Hamas in exchange for some relief from the effects of the siege. Over the next seven years, that is from 2007 until this latest assault on Gaza, battles between the IDF and the Gazan Resistance forces have been brutally lopsided affairs. During the 2008 IDF assault on Gaza, codenamed 'Operation Cast Lead', up to 1600 Palestinians were killed, around 900 of them civilians, whereas Israel lost 13 of its citizens, of whom 10 were IDF combatants. In those early years of the siege Israeli policy appeared to be working. Hamas was being constrained militarily and the West Bank was relatively stable in that there hadn't been a major resumption of the popular protests and violence that erupted with the First Intifada in 1987 and continued through to the end of the Second Intifada in 2005. This popular perception that Israel could terrorise Gaza into submission every few years at little cost to itself and with absolute impunity has been significantly weakened by the outcome of the latest Gaza war. War, as theorised by the famous 19th century Prussian military theorist Carl Von Clausewitz, is a means towards political objectives, or more simply, "an act of violence intended to compel one's opponent to fulfil one's will". Israel's stated war-aim from the beginning of the conflict was to disarm the Palestinian resistance presumably by severing the supply-lines used by resistance factions like Hamas and Islamic Jihad to acquire their weapons. Israel achieved none of these objectives while suffering the heaviest casualties in battle since being defeated by the Lebanese resistance Hezbollah in 2006. The IDF lost 64 soldiers in the last war, which is extremely high compared to its operations in the past. During Operation Cast Lead (2008-09) the combatant casualty-exchange ratio between the Gazan Resistance and the IDF was absurdly lopsided at around 1:85 (the IDF lost 10 soldiers). This time the ratio has evened out drastically to around 1:6, which reflects the much improved tactics and weapons capabilities of resistance militias like Hamas and Islamic Jihad, but also makes clear to Tel Aviv that they'll be forced to pay a much heavier price than could be politically acceptable if they continue trying to disarm Gaza instead of negotiating. That the Palestinian resistance in Gaza has gained in strength since the imposition of the siege, instead of being weakened, reflects the commitment of their regional allies, namely Iran, Syria and Hezbollah, in ensuring that groups like Hamas and Islamic Jihad receive the military assistance they need. For one, the rocket arsenal of the Gazan resistance has improved drastically. During 'Operation Cast Lead' Israel's airstrikes left their signature landscape-transforming craters across Gaza's cities, while the Qassam rockets managed only to punch holes through house-ceilings. Today however the resistance arsenal has expanded significantly to now include the Syrian-made M302 Khaybar, which has a range of 160km making it capable of reaching the northern Israeli city of Haifa; as well as the M75 rocket, which is the local Gazan version of the Iranian Fajr-5, and which has a range of 75km making it capable of hitting Tel Aviv. Rocket-fire from Gaza is routinely characterised in the corporate media as 'indiscriminate' in the sense that they target Israeli civilians, however there's much to suggest this isn't the case. Firstly the rockets haven't killed ANY Israeli civilians. Secondly, according to Professor Ted Postol, a weapons expert with a history of debunking exaggerated military claims (search for him online next to 'Patriot missiles controversy'), Israel's claim that it's their Iron Dome missile defense system (which uses missiles to shoot down incoming missiles) that keeps Israeli civilians safe, is wrong since only 5 percent of Iron Dome engagements actually succeed in intercepting rockets. The absence of Israeli casualties is more a product of Israel's civil defense system, which sets off sirens to warn people about incoming rockets giving them time to run to their nearest bunker. In the recent war, the Palestinian resistance managed to hit airports in Tel Aviv causing the US government to temporarily ban flights to Israel, which according to IHS Jane's 360, "underlines Hamas's ability to inflict economic damage on Israel". 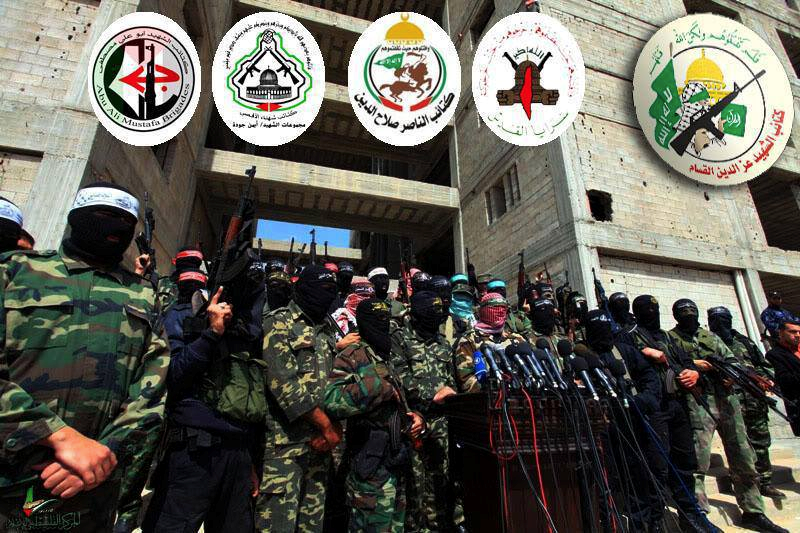 A senior official of the Ezzedine Al-Qassam Brigades (the military wing of Hamas) speaking to the defence analysis think-thank IHS Jane's 360, made it clear who supported them, stating, "we have benefited from all the Iranian, Syrian, [and] Hizbullah tactical combat schools, and finally formulated [a] Qassam independent one that matches our situation and [leaves us] capable to respond to our enemy's challenge" (22/07/14). The military assistance of these three forces in particular (Iran, Syria, and Hezbollah) is often cited as one of the motivations (among others) behind the eruption of the Syrian conflict since the overthrow of the Syrian state would significantly weaken any Palestinian resistance to Israel's ongoing campaign of ethnic cleansing. Today in Syria, President Assad's government finds itself battling various fronts comprised of brigades whose loyalties shift rapidly based on the availability of arms and financing. The most powerful and brutal insurgent formation to have emerged is the Islamic State (formerly known as 'Islamic State of Iraq and Syria' or 'ISIS'). Netanyahu made comments recently conflating Hamas with the Islamic State stating that they were "all branches of the same poisonous tree", however what’s rarely mentioned is that Israel has played an important covert role is undermining the Syrian government's war against the Islamic State and other similar sectarian death-squads. For one Israel has repeatedly launched airstrikes at Syrian Arab Army positions, which have strategically benefited insurgents on the ground. Israel has also allowed the Al-Qaeda affiliate Jabhat Al-Nusra to operate within the "zone of separation" between Israeli and Syrian forces. According to the Washington Institute, a U.S. foreign policy think-tank, that Al-Nusra operates in this area makes it “harder for the [Syrian government] to use its weapons of choice - including artillery, scud, missiles, and rockets - against opposition positions [Al-Nusra] without the risk of hitting Israeli-controlled areas and drawing an Israel Defense Force (IDF) response”. When insurgents fighting the Syrian Arab Army are injured in battle, they have been provided with medical assistance in Israeli military hospitals, as revealed by publicised video footage in July, which showed Netanyahu shaking hands with an injured insurgent fighter (see Figure 5) . Similarly in April last year, Senior Israel Defence Ministry official Amos Gilad stated the threat posed by Al-Qaeda gaining control of Syria was “not the same threat as one posed by Iran, Syria, and Hezbollah together, which is much more difficult”. He also explained that the threat faced by the Syrian government was also “a blow to Iran and Hezbollah”. As it stands currently, the three year campaign by the United States, the European Union, Turkey, Saudi Arabia, and Qatar to overthrow the Syrian government appears to have failed. President Assad has managed successfully to address the legitimate grievances of the Syrian people, including demands for constitutional reform, that culminated in his reelection in June for a third term in Syria's first multi-candidate Presidential elections since the Baathist coup of 1963. These reforms have also meant that the only forces left fighting to topple the Syrian government are groups dominated by foreign fighters like the Islamic State, Jabhat Al-Nusra and the Islamic Front, whose theocratic designs are irreconcilable with Syria's secular institutions and pluralistic national character. Meanwhile in Gaza, the majority are under 25 years of age meaning that for them, the seven-year siege has constituted a major portion of their lives, and in that time, the Hamas government hasn't budged in response to Israeli terrorism, and have also argued that the conditions of near-autarky imposed on the Strip has led to greater self-sufficiency. It appears Israel is running out of options regarding Gaza since this latest attempt at neutralising the resistance has only culminated in the IDF being forced to pay a heavy price (by Israeli standards) for maintaining the siege. That the Gazan resistance has benefited greatly from the patronage of Iran, Syria, and especially Hezbollah, helps explain why, only ten days after the Gaza ceasefire, the IDF revealed in an Israeli TV report that it was preparing for its next war against Hezbollah. For Hezbollah, the prospect of fighting on two fronts, that is against the Islamic State and Al-Nusra death-squads at home in Lebanon and in Syria; while facing what could be the largest IDF invasion since 2006, will pose a serious challenge.